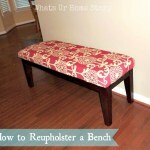 Can you believe this DIY bench makeover was my first ever furniture makeover project? This might have even paved the way for this blog! We purchased this faux leather bench from Overstock 7 or 8 years ago.For the first 4 yrs we used it as extra seating by the bay window in the family room in our old house. When we moved to VA, we didn’t really use it for almost a year. Then one day this great idea popped up in my head, “Why don’t we use it with our Ikea JOKKMOKK eat in kitchen set (our formal dining table was in the storage while we rented)”? That way we could have more room at the table. Bad……….idea! Constant abuse from the kids day in and day out and within a year the faux leather was cracking and we had a very sad looking bench. Time for a face-lift! Again, borrowing inspiration from my DIY gurus at YHL went to JoAnn looking for fabric. My first time in a fabric store in the US! I really liked this Suzani indoor/outdoor fabric. All I knew was the size of the bench, 3 x 5 feet loosely measured. No idea how much that was converted in yards. Still have no clue. I know, not a great thing to be proud of for an engineer. Anyways….the person at the cutting section (I guess that’s what it is called? Help me out folks…please) was really helpful and told that I would need 2 yards just to be on the safer side. Turned out to be more than enough, actually I have enough fabric left over to make a throw pillow too (on the to do list already). The fabric was $19.99 a yard and I used a 50% off coupon that I found online. So for 2 yards I ended up forking out $19.99. Not uber economical but still better than buying a new bench. I could have also waited for the fabric to go on sale (like now, it is 50% off) but I was pretty impatient. Unfortunately I do not have a step by step picture tutorial for the DIY bench as it was during my pre-blog days. I basically followed John & Sherry’s advice. Be careful with your corners. Details below, a bullet point is not enough! As I mentioned, the trouble spots are the corners. If you have a thin batting or a thin sheet of foam you are safe, folding them like wrapping a present is the way to go. But if you have a thick layer of foam like ours, totally different ball game! Be really patient. Wrap it like a present but do not pull it tight (very very important) otherwise you will end up with what happened to our left corner! Look closely, that one is not square while the other corners are. The funniest part, we didn’t realize it until after we were done screwing the top back on! We felt lazy and left it as it is. Anyway, in its new avatar this was going to be the kids’ piano bench. So it is bound to suffer more abuse. We’ll fix it at the next reupholstering session. what a wonderful transformation vidya!!! you did a great job. i love to re-purpose furniture.. make sure that you sign up on Joanne fabrics, they will email you coupons and specials they run . you can also sign up for michaels coupons if you havent already.. those come in handy. Thanks Grace. Learned about the Michaels/Joann coupons recently. Yes I have signed up on the website. Thanks Somu. Yes definitely will do a step by step next time.